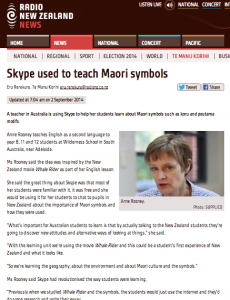 Radio New Zealand: Skype used to teach Maori Symbols. This story began with seeing a need to teach Global Digital Citizenship, following Vicky Davis, Cool Cat Teacher and then reading about Flat Connections. Wanting to explore further the ideas of the ‘flattening the classroom’ I completed the Flat Classroom course on Atomic Learning and contacted Vicky who advised me to become involved in Flat Connections. 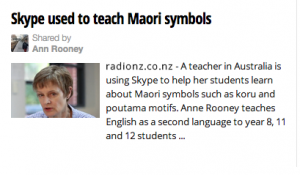 To facilitate this collaborative project with New Zealand I created a lesson on Skype in the Classroom and this, serendipitously, sent a Tweet (I was unaware of this) that was seen by Eru Rerekura from Radio NZ National who then contacted my school about interviewing me. So, this is my serendipitous event. It all started with a desire to connect. For my students to learn by communicating, sharing and researching globally in an authentic collaborative research project. Below is the podcast of the news report. I am speaking for about one minute, towards the end. How amazing is New Zealand to have positive news reports about education on the local news. Surprisingly, my collaborating teacher in NZ, Jan Newbold, heard it in her car while driving to work. Claire Amos Deputy Principal at Hobsonville Point Secondary School. Tagged atomic learning, Cool Cat Teacher, flat connections, Global Digital Citizenship, Jan Newbold, Radio NZ. Bookmark the permalink.